My Mom’s Moroccan Beef Stew is hearty, flavorful and perfect for a chilly night! 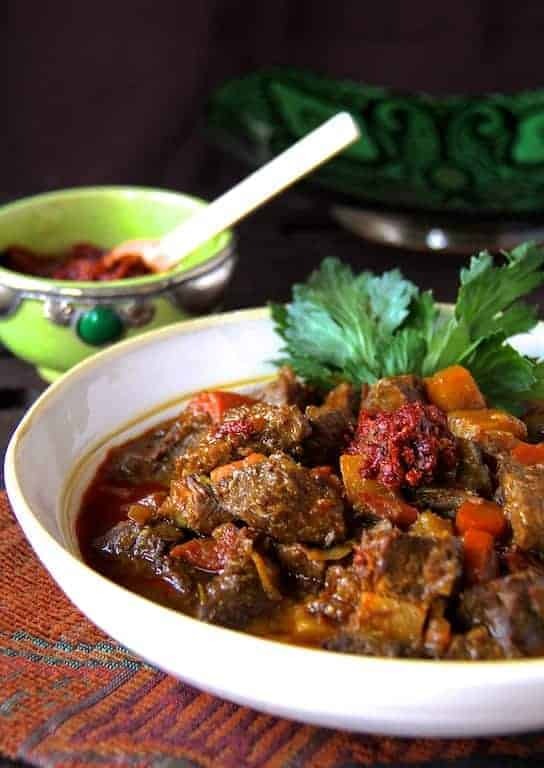 It may not be a beef stew time of year, however, for me there’s no better recipe to share with you for Mother’s Day than one of my mother’s award-winning recipes–Mom’s Moroccan Beef Stew. My mother, Ann Ramczyk, was an award-winning cook. 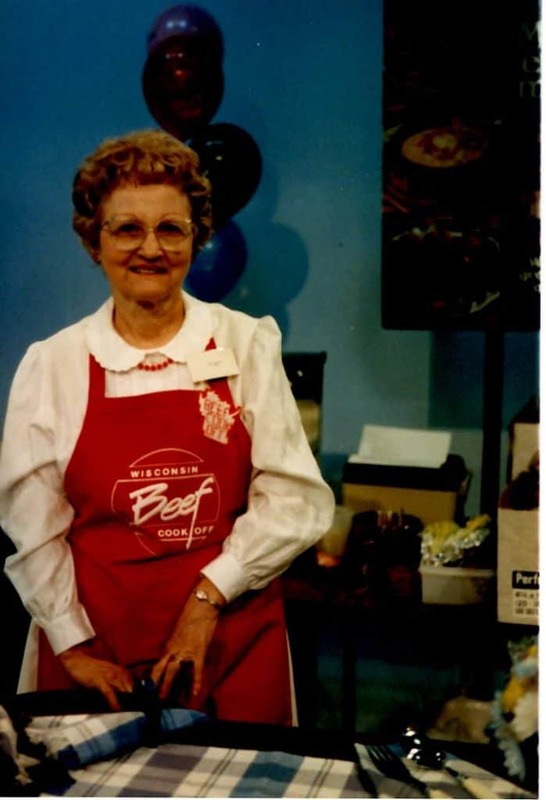 Besides winning numerous local and state cooking competitions, she represented Wisconsin twice at the Pillsbury Bake-Off and twice at national beef and chicken cook-offs. 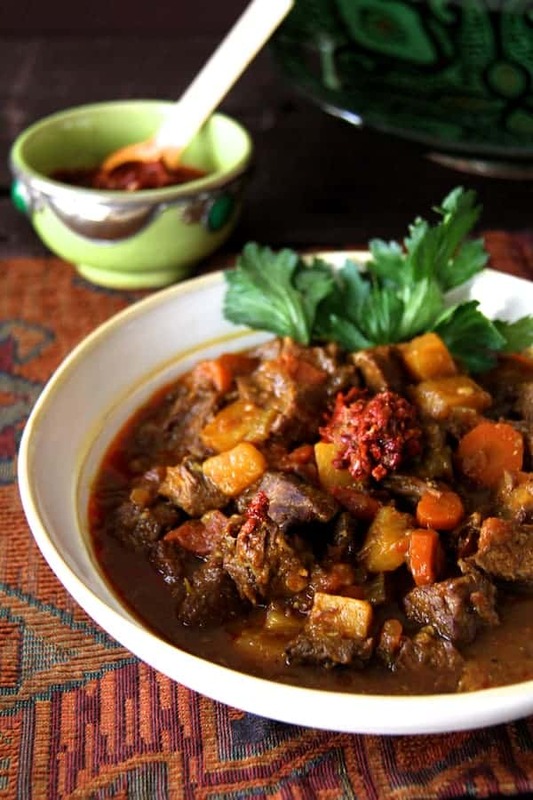 This Moroccan Beef Stew was the first-place winner in the 1988 Wisconsin beef cook-off. I’ve made some adjustments to her recipe over time, but some things Mom just knew best — like using a chuck roast for the stew meat and hand-trimming it. To this day, I don’t purchase anything labeled “beef stew meat,” which is often bits and pieces of a variety of cuts that can result in different meat textures within the stew. When I make this dish, I purchase about a 2 1/2 to 3-pound chuck roast. After trimming and cubing it, I have just over two pounds of meat that I’m confident will yield a consistent texture throughout. Mom used canned pineapple for her winning dish, but I prefer the sweetness of dried apricots instead. Mom slow-cooked her stew on the stovetop. However, my secret weapon for getting stews done quickly is an electric pressure cooker. She never used the old stovetop pressure cookers because of their reputation for exploding. However, today’s pressure cookers — both electric and stovetop — are extremely safe. An added bonus with electric pressure cookers is they are often 3-in-1 devices that also include a rice cooker and slow cooker. Just lock the lid, set the pressure and timer and you can move on to another task. When the stew is done, release the pressure on any pressure cooker as gradually as possible. If done too quickly, the meat can toughen up. Electric pressure cookers don’t go all the way to 15 psi (pounds per square inch) of pressure. If using a stovetop pressure cooker, you will need to adjust the cooking time because they do go that high. To make the stew another old-fashioned way, you can also do it in a 325-degree oven for about the same amount of time as on the stovetop. My final touch is to add the harissa, a spicy condiment common in North African cuisine. Garnish with celery leaves (another frugal tip from Mom) and serve with couscous or rice. Hope you enjoy and please share this From A Chef’s Kitchen reader favorite! STEW: Combine flour, salt and pepper on a plate and dredge beef pieces. Heat olive oil over medium-high heat in a Dutch oven and brown beef evenly in batches. Pour off excess drippings. Combine the paprika, coriander, turmeric, cumin, ginger and cayenne and sprinkle over beef. Add the celery, onion, carrot, garlic and beef broth. Bring to a boil, reduce heat to low, cover and cook 1 1/4 hours to 1 1/2 hours. Alternately, combine the ingredients in an electric pressure cooker and cook on High for 22 minutes or in a slow-cooker for 4 hours on High or 8 hours on Low. Add the apricots and tomatoes. Cook an additional 15 minutes on the stovetop, 1 more minute on high in the pressure cooker. If using a slow-cooker, add when 1 hour is left to go. Garnish with celery sprigs and serve with harissa. HARISSA: Place peppers in a small saucepan with enough water to cover. Bring to a boil. Turn off heat and let stand 20 minutes. Remove stems and seeds and transfer to a food processor or blender. Combine cumin and coriander in a dry, nonstick skillet and toast briefly until fragrant, about 30 seconds. Add to the peppers along with garlic, olive oil and red wine vinegar. Blend to a smooth paste. Season to taste with salt. TO MAKE AHEAD: Stews are always better when they have an opportunity for the flavors to meld. Cook up to two days ahead and keep refrigerated. TO FREEZE: Cool thoroughly and place in an airtight container. Freeze up to three months. 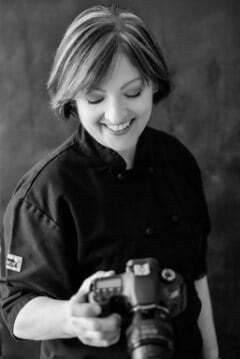 Hi, Ameerah, Jusy my mom’s award-winning recipe. Thanks so much and hope you enjoy! My mom went to a class about the benefits of turmeric, and I told her I’d find recipes that had turmeric in them, this…you! This dish is so amazing, and everyone that has had it had me send this link while still at the table. So…brava. My local store has a Harissa mix in the bulk spice section, so maybe people want to see about that where they shop. It was a mite less tasty than yours but it did save a step in a pinch. Hi, Mark, Thank you SOOO very much! You really made my day! So glad you and your guests are enjoying this recipe! My mom would be so humbled and happy! Thanks again and please stay in touch! How long would you cook the tomatoes and apricots if you made it in a slow cooker? Hi, Emily, Thanks so much for your great question! It will depend on the amount of time you have the slow-cooker set for. For a 4-hour setting, I would add when one hour is left to go. Thanks so much and I adjusted the recipe to include that information. Hope you enjoy! Made this for dinner last night and it was really yummy. I also made couscous and ganished the with pomegranate seeds and parsley sprigs and it look really pretty. Thanks so much, Selena! Glad you enjoyed and your presentation sounds gorgeous! when you are using a pressure cooker do you do a quick release so you can add the apricots and tomato in? Also after its finished the additional minute is it a quick or natural release? Hi, Tasha, Thanks for your good question! I would recommend a slow release after the initial cooking period. If you release the pressure too quickly, the beef can seize up and become tough again. That extra minute at high pressure shouldn’t affect the beef too much and should be just enough to get the apricots and tomato soft. I’d still do a semi-slow release–not natural, not quick–somewhere in between. Please let me know how it goes! I’d like to try this recipe, it sounds delicious. But I wonder about the harissa…do you use all of this spices in one single meal, or do you mix the spices and then use just some of it (how much?) and keep the rest for later occasions? Thanks for your question. Use as much or as little as you want on the stew. If you don’t like things spicy, you could leave off if you like. Hope you enjoy! This was delicious . The combination of spices and the apricots was wonderful. Thank you so much! I appreciate the feedback and please stay in touch. This looks delicious. Could it be doubled or tripled for the pressure cooker? I don’t have one, although do have access to my mom’s old (’40’s or 50’s cooker) and have considered buying one. Yes, it can be doubled. Pressure cookers have a limit as to how much liquid/contents you can place in them. There has to be some space left at the top. I highly recommend electric pressure cookers. (I have a Cuisinart.) You can set them and forget them and you free up a burner. Be careful of those old pressure cookers; they don’t have any safety measures built in. Thanks so much for your question. Let me know how it goes! Thanks, Gwen! Some things Mom knew best, like cuts of beef! Do let me know if you try and how you like!